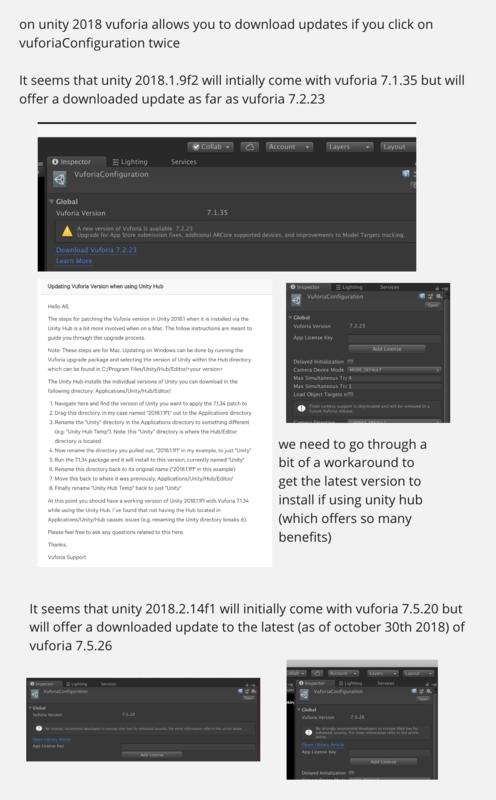 The steps for patching the Vuforia version in Unity 2018.1 when it is installed via the Unity Hub is a bit more involved when on a Mac. The follow instructions are meant to guide you through this upgrade process. Now rename the directory you pulled out, "2018.1.1f1" in my example, to just "Unity"
Run the 7.1.34 package and it will install to this version, currently named "Unity"
Finally rename "Unity Hub Temp" back to just "Unity"
At this point you should have a working version of Unity 2018.1.1f1 with Vuforia 7.1.34 while using the Unity Hub. I’ve found that not having the Hub located in Applications/Unity/Hub causes issues (e.g. renaming the Unity directory breaks it). Please feel free to ask any questions related to this here. Hi, I just found this and will try it.